DID OUR ANCESTORS DRESS UP FOR HALLOWEEN? I only have a couple of photos of my ancestors “dressed up.” I can’t even say for sure if this was Halloween or some other costume party. But, here are the photos I have. 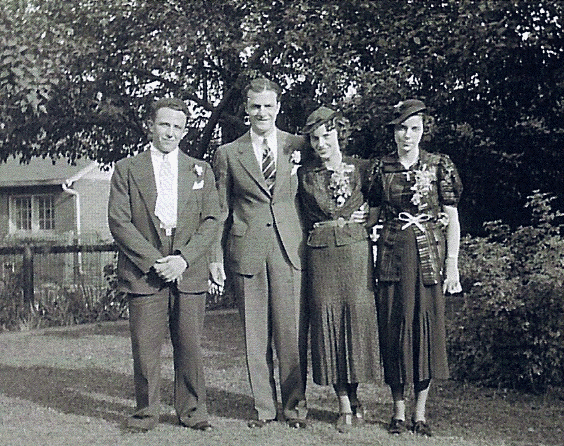 The tall guy wrapped in a blanket, with feathers on his head is my maternal grandfather, Joseph A. Milne. I guess he was supposed to be an Indian. I don’t recognize any of the other people in this photo. His wife, my grandmother, is not in this picture. Is she taking the photo? Or, is this prior to their marriage? He was 23 when they married, so it could be. I cannot tell how old Joseph is in these photos. Comparing to other pictures I have of him, he appears to be in his 20’s here. Guess I’ll never know. Share your ancestor dress up photos or stories with me, either in a comment or on your own blog post. Happy hunting….or should I say Happy Halloween? The recent announcement that the Detroit Free Press is now available online for those of us outside of the Michigan area, has been fantastic for my research. Here’s a link to my post about this new resource Detroit Free Press 1837 to Sep 2015 now online. It takes some ingenuity and a few search tricks to find what you’re looking for, but if you’re persistent it pays off. I was able to find the marriage license listings for my father, Harry Norman Gould to his first wife, Elaine Gertrude Croft and the license for Elaine’s sister, Lucille Croft to her husband Robert Beach. My Dad and Robert “Bob” Beach were best friends and they married sisters. While I was growing up my Dad told many stories about his adventures and shenanigans with his friend Bob. Here is the license announcement for my Dad & Elaine. Here is the license announcement for Robert Beach and Lucille Croft. While I did not find any photos or wedding details, at least I have this information. Every bit of evidence we find adds validity to our research. What will I discover today? I can’t wait to find out. These are the headstones of Dr. Jeremiah Hall, born 11 Jun 1722 in Wrentham, Colonial Massachusetts, died 1 Oct 1807 in Pembroke, Plymouth, Massachusetts. He married Elizabeth Bailey, born Aug 1727 in Scituate, Plymouth, Massachusetts, died 16 Feb Pembroke, Plymouth, Massachusetts, in Dec 1748. They are my husband’s 4th great granduncle & aunt. My husband is a direct descendant of Jeremiah's brother, Jesse Hall. Here is a page from Massachusetts, Town & Vital Records, 1620-1988, showing the death dates for both Jeremiah & Elizabeth, along with other Hall family. Here is a hand written page, indicating Dr. Jeremiah Hall’s death. Source: Ancestry.com. Massachusetts, Town and Vital Records, 1620-1988 [database on-line]. Provo, UT, USA: Ancestry.com Operations, Inc., 2011. Jeremiah Hall, Jr., born 20 Dec 1759 in Pembroke, Plymouth Massachusetts, killed in action 24 Jan 1776, during the Revolutionary War. Massachusetts Vital Records to 1850 (Online Database: NewEnglandAncestors.org, New England Historic Genealogical Society, 2001-2008). Several of their children are linked to their memorials. CEMETERY RECORDS–What can they tell you? How do you use them? This could not be a bigger headline for all of us with ancestors in Michigan. There has been limited access (outside of Michigan) to any online issues of the Detroit Free Press until now. Available issues from 1837 to September 2015. I spent last evening entering names & finding articles. I found 15 news articles in an hour. Everything from engagements to marriage announcements to obituaries and just every day who is visiting from out of town articles. Here is the link Detroit Free Press. Go to Archives in the left column and you will be taken to the page to search. Even if you are already a subscriber to newspapers.com (as am I), you will have to pay for an additional subscription to access the Detroit Free Press. There is a yearly option for $59.95 and a monthly option for $7.95, which is what I opted for at this time. Here are a three of the articles I found last evening. Have fun fellow Michigan descendants. Off I go to look for more articles. How did I come upon this gem of information about the Pioneers of Massachusetts? In a kind of roundabout way. Randy Seaver in his Genea-Musings blog told us that the Worcester County, Massachusetts Probate File Papers, 1731-1881, are now on AmericanAncestors.org. I don’t have a current subscription to the NEHGS website (AmericanAncestors). I checked my database for any ancestor connections to Worcester County, Massachusetts and didn’t find any. As you can see, you can search by name, keyword, page number etc. In this case I entered the name Cornelius Fisher, one of my husband’s ancestors. The “hit” shows his name, but more importantly it names his wife, Leah, which matches what I have in my database. There it is. A section about the HEATON family. Again, a match to my database info, as I have Nathaniel Heaton and Elizabeth Wight as Leah’s parents. In reading the forward in this book, it is stated that the records come from various town and church records. This book can be purchased in both print & ebook format. Or you can go to this site Internet Archive and download a version for free, or read it directly from the site. This book is copyrighted before 1923, making it public domain. Here is how Ancestry describes this collection. What I found as I entered some names was that the list of hits was quite extensive. So I decided to search another way. By using that list on the right hand side of the page and browsing by surname. In doing my search this way I was able to easily find the sections of the book that talk about the surnames I am interested in. On these pages I found Clark and Morse, two names in my husband’s ancestry. WHAT INFORMATION CAN I FIND IN THESE LISTINGS? As an example I will look at the section for Samuel Morse. See the page above, on the right, lower right corner of the page. When Samuel settled in Dedham, Mass. WOW! That’s a LOT of information. Can we just take this information as the truth and be done? NO! We need to find other evidence to verify what is stated. But, boy, it sure gives us a great start. I will continue to search through this database. As I do, I download each page that I find, name it and save it to my computer. Make sure you download the Title & publisher page so you can cite it when you create your source citation. NOTE: When I find a source such as this, with many pages I will be referring to and connecting to my data, I first create a special folder to save all the images to. In this case I created a subfolder under my BOOKS folder, titled Pioneers of Massachusetts. Later these images will be more thoroughly named and placed in the proper surname folders. Here’s a screen shot of what I have right now. You can see the pages I have saved so far. I’m anxious to get back to this site and do some more exploring. Then I will be evaluating each item one by one and determining what records I need to look for. These are the headstones of my paternal great grandparents, Vivaldo William “Val” Gould & Mary “May or Mae” Eve Thorp. I took these pictures when I first went to Mt. Olivet Cemetery in Detroit, back in 2007. I never new my great grandparents on either side of my family. However, my Dad talked about his grandparents, Val & Mae all the time. He called them Beepa & Meema. My Dad was the only grandchild born to the six children of Val & Mae Gould. Because of this, he was well loved and doted upon. I’ve done extensive research on both sides of this family. However, I’ve come up against a brick wall when it comes to Vals father, John C. Gould. I know quite a bit about his life, but have no idea who his parents were. Not being able to take my own surname back further is one the biggest regrets of my research, so far. I wrote a post about John C. Gould in my Mystery Monday-Who’s Your Daddy? series. You may read it here. Mary “Mae” Eve Thorp was the second of ten children born to Horace Henry Thorp & Catherine C. Dorsey. She was born 4 Apr 1862 in Oswego, Oswego Co., New York. By 1867-1868 her family had moved to Detroit, Michigan. I have not been able to locate the marriage record for Val & Mae. I’ve looked in U.S. and Canadian records extensively and often, using so many spelling variations. So far, no luck. Their first child, Ford was born in 1884, so the marriage may have taken place sometime prior to that birth. All of their children were born in Detroit and most of the family never left the area. Here are their children. I descend from their son, Harry. Ford Val Gould 1884-1947, never married. Harry Whipple Gould 1886-1960, married on 6 Jun 1912, Marie Wallace Lindsay 1888-1970. They are my grandparents. Roy V. Gould 1888-1971, married on 30 Jun 1909, Emma S. Redcap. They had one child who was stillborn. Gladys Lillian Gould 1890-1966, married Charles E. Smith on 3 Jul 1920. No children. May Adele Gould 1898-1984, married first James Connors on 30 Jun 1920. Married second Myron Albert Sine on 4 Sep 1934. No children. Helen C. Gould 1901-1945. Never married. I have many pictures of this family and have located nearly every vital record associated with all of them. Except for that pesky marriage record for Val & Mae. You may visit the findagrave memorials for Val & Mae by clicking on their names. Today I am presenting the last will and testament of my husband’s great grandfather, Elmer E. Bright. Elmer was born Nov 1859 in Sharpsburg, Allegheny, Pennsylvania to William Bright and Mary Jane Flynn. He married Malissa M. Hunt on 20 Jul 1881. Malissa was the daughter of James Hunt and Catherine (maiden name unknown). Elmer or Ellmer as it was sometimes spelled, worked as a glassblower and the family lived in Tarentum, Allegheny, Pennsylvania. On 19 Apr 1882 Elmer and Malissa had twins. One of the twins died at birth and the gender is not known. The other twin was my husband’s grandmother Daisy Fern Bright. On 10 Apr 1887 Elmer and Malissa had another daughter. They named her Mabel. Sadly, Mabel died on 16 Feb 1888 before she could celebrate her first birthday. Less than a year later we have Elmer signing his last will and testament. He had contracted consumption/tuberculosis and was only 29 years old. To add more sorrow to this story, his “beloved wife” Malissa died three years after him, on 17 Feb 1892 of possible heart failure. This event left Daisy an orphan at the age of 10. She went to live with her Aunt & Uncle, Thomas & Edith Hunt, also of Tarentum. Here is the actual image of Elmer’s will. Here is my transcription of the document, including any words that I didn't understand. First: I direct all my just debts & funeral expenses be fully paid as soon as conveniently may be after my decease. Second: All the rest residue and remainder of my estate real personal and mixed I give devise and bequeathed to my beloved wife Malissa M. to have and to hold during her natural life or so long as she remains my widow, but should she marry again or die, then I give all my said estate to my beloved child Daisey F. provided and it is my will that should my said child Daisey die without leaving to survive her child, children or grandchildren, then I give said estate to her mother, my said wife in fee. Lastly, I nominate constitute and appoint my said wife sole Executrix of this my last will and Testament and I appoint my friend Charles E. Barr Guardian of my said child Daisey F.
Signed sealed published and declared by the said Testator Elmer E. Bright as & for his last Will & Testament in the presence of us who have, at his request & in his presence & in the presence of each other affixed our names as witnesses thereto. Be it known That on the Third day of May A.D. 1889 before me, Samuel P. Conner, Register of Wills & in and for the County aforesaid came Thos J. Ford and Nanie Hunt the subscribing witnesses to the foregoing last Will and Testament of Elmer E. Bright deceased and on their solemn oath did depose and say that they were present and did see and hear Elmer E. Bright the testator therein named sing, seal publish and declare the same as and for his last Will and Testament, and at the time of so doing he was of sound mind and memory to the best of their knowledge and belief and at his request and in his presence they subscribed their names as witnesses thereunto. Now May 3 A.D. 1889 the testimony of the above named witnesses being sufficient, I do hereby admit the foregoing Will to Probate and order the same to be recorded as such. Be it known, That on the 3 day of May A.D. 1889 Letters Testamentary with a copy of the Will annexed upon the Estate of Elmer E. Bright deceased were duly granted unto Malissa M. Bright the Executrix in said Will named who was duly sworn to well and truly administer the goods and chattels, rights and credits which were of said decedent and to faithfully comply with the acts of assembly relating to collateral inheritances. You may visit the memorial’s for Elmer, Malissa & little Mabel by clicking on each of their names. Here’s a post I wrote about Daisy Bright on Surname Saturday. PLEASE CONTACT ME IF YOU ARE RELATED TO ANYONE MENTIONED IN THIS POST.